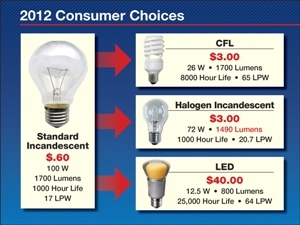 Beginning in 2012, new light bulb efficiency standards will affect which bulbs are available in stores. Here’s what you need to know. Are CFLs safe to use, considering they contain mercury? According to the EPA (Environmental Protection Agency), CFLs (compact fluorescent lights) in the U.S. contain an average of 4 miligrams or less of mercury. For comparison, an old fashioned mercury thermometer contains 125 times more mercury than one CFL. For that matter, there is more mercury in one bite of albacore tuna than in one CFL. While there is no evidence that exposure to the mercury in a broken bulb presents a health risk, information for safely cleaning up when a CFL breaks is available from the EPA at www.epa.gov/cfl. By January 2012, all new medium screw-base bulbs will have more comprehensive labeling to help consumers understand and compare each type of light bulb. Information on new bulb labels includes: lumens (brightness), estimated yearly cost, life expectancy, light appearance and energy used. For more detailed information, go to www.LumenNow.org. To read more about U.S. light bulb requirements, click here. For information about Canadian light bulb standards, click here. Additional resources: www.LumenNow.org and www.epa.gov/cfl.